Northern Maine Community College marked the official beginning of its water treatment technology program on Thursday, Oct. 11, with a ribbon cutting for a newly built lab that serves as a hands-on classroom space for students. 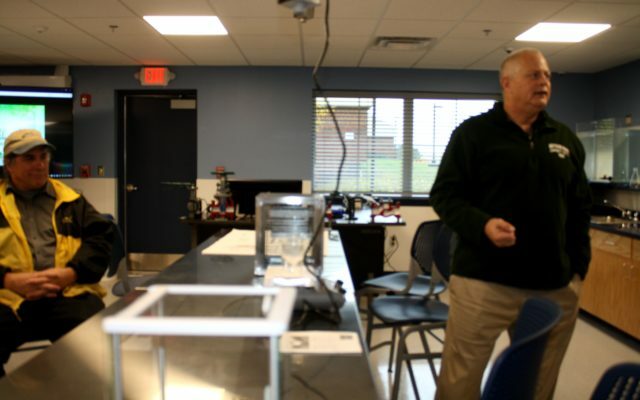 PRESQUE ISLE, Maine — Northern Maine Community College marked the official beginning of its water treatment technology program on Thursday, Oct. 11, with a ribbon cutting for a newly built lab that serves as a hands-on classroom space for students. Officials from NMCC, the Maine Department of Environmental Protection, Maine Department of Health and Human Services and the water treatment technology field have been collaborating for nearly two years to create the necessary programming at the college to train students and fulfill what they believe to be a crucial workforce need for the state. Those efforts have resulted in the creation of a two-year associate’s degree in water treatment technology and certificate programs for both water and wastewater technology. The expected retirement of those current employees provided much motivation for NMCC to establish what is thus far the only college-level water treatment technology program in Maine. Currently six students are enrolled in the program, but instructor John Belyea, who also is a licensed professional engineer, expects that as more people become aware of the career opportunities available, the program will grow in size. In spring 2019, the courses will be available to students across the state and country through video conferencing from the NMCC lab. To design the new laboratory, Belyea drew inspiration from a similar space created by colleague Robert Rak, coordinator and professor of environmental technology at Bristol Community College in Fall River, Massachusetts. The space includes a pilot water treatment system and water analysis equipment. Students from NMCC’s building construction technology and plumbing and heating programs assisted with the building of the lab. Belyea noted that the lab space will allow students to combine what they’ll learn in mathematics, chemistry, physics and natural sciences with the practical skills needed to operate machinery and tools in a real water treatment facility. They will also go on tours of the 12 water treatment facilities in Aroostook County and meet the people who might soon be their future employers and co-workers. “Our classes have been going very well this semester. The students are bright, responsible and willing to work hard to understand the material,” Belyea said. Student Amanda Guerrette of Caribou currently is a medical technician and certified nurse’s assistant at the Maine Veterans Home in Caribou and said she decided to enroll in the water treatment technology program to pursue “something different” in her professional career. “This is my first time attending college. I’m not sure yet which jobs I’d like to pursue after graduating, but I’m open to whatever comes my way,” Guerrette said. Clinton Perry of Woodland earned a degree in computer technology from NMCC in 2013, but saw the potential for career growth when he learned about the demand for younger workers in the water treatment technology field. “I’ve enjoyed the classes because they’re challenging and hands-on. I appreciate how we’ve been able to actually use the tools that we’ll be using in our work as well as learn about them,” Perry said. For more information about NMCC’s water treatment technology program, contact Belyea at (207) 768-2775 or njbelyea@nmcc.edu or visit https://www.nmcc.edu/.